Lotus F1 Team Chairman Gerard Lopez sets the record straight on the issues concerning the team as it heads into the final three races of the 2013 season. Q: WHAT’S THE OBJECTIVE FOR THE TEAM IN THE NEXT THREE RACES? The objective is very clear; we want to get that second position in the Constructors’ Championship. As long as it’s mathematically possible that is the one and only objective we should have as a team. It makes a big difference to us, in terms of many things. We do have arguably the second best car out there, so there’s no reason why we cannot put up a good fight and try to get that second position. Q: HOW IS THE RELATIONSHIP WITH KIMI? Good. I speak with Kimi more than a lot of people probably realise and we rarely speak about Formula 1. Of course, recently a lot was made about the comments between Alan Permane and Kimi during the course of a tense moment in a race, but this was just one exchange taking a matter of seconds in the course of a two-year relationship. It certainly wasn’t the most beneficial few seconds, but you have to step back and accept that everyone is passionate about racing and sometimes these things do happen. Q: WHAT IS KIMI LIKE TO WORK WITH? From my perspective, Kimi is often misunderstood. He’s actually a very talkative, very friendly guy. One of the unfortunate things about being in the limelight is that people are always trying to make it look like there are huge fights going on. For instance, we discussed the fact that Kimi was signing for Ferrari between the two of us and it was a very frank discussion. It was factual, emotional at the same time and although it’s funny to say, he’s a very human human-being. The whole Iceman thing actually prevails on the track from where he is very cool-headed and a very good driver. In reality he’s a kind guy, he’s a very talkative guy and over the two years I’ve gained a friend in Formula 1 which is a difficult place to do so. Q: DID KIMI’S ANNOUNCEMENT THAT HE WAS GOING TO FERRARI CHANGE THE RELATIONSHIP? For a long time we had the opportunity to keep him in our hands, but we weren’t able to operate to the timeframe – or make the offer – that Ferrari were able to do. For me this brought sadness, as it’s like prodigal son leaving us. When we signed him there was a lot of criticism and a lot of disbelief. There were some people who were saying that he still had it in him and that he was one of the best Formula 1 drivers out there, but at the same time there were many people who were saying that he couldn’t do it, that he was overweight, this, that and the other. But we believed in him and he delivered big time. The only reason we’re fighting for second in the World Championship is because of all the points that Kimi has scored. We’re doing everything we can to ensure Kimi and the team can continue to fight right up to the chequered flag in Brazil. Q: WHAT HAS KIMI BROUGHT TO THE TEAM OVER THE PAST TWO YEARS? He’s been a number of things to the team; some of which have been quite obvious to people, and others which are less obvious. The first thing that Kimi did was to remove any excuses from the team. We knew we had one of the best ever drivers in Formula 1 and as a result of that there was no escape from whether the cars were good enough. With Kimi we knew we had a benchmark. This gave people the belief that whatever we put on the car or put into development, was going to get maximised on the race track. That is very motivating for anyone working in the team and in the factory; the fact that you know you’re putting all this effort into making something which you can transform into performance on the track. The second thing he did was match really well with who we are as a culture. We are at the pinnacle of motorsport and we are a very serious, hardworking team, but nobody in the team considers Formula 1 to be an elite club in which you cannot have fun, and we have a pretty relaxed attitude on a number of things; for sure not on performance, and for sure not on development. It’s not as clinical as other teams, and he fits right into that. For us essentially he was the perfect puzzle piece and for him I think it was a perfect fit. I still think it’s one of the best partnerships in Formula 1. The third thing he did is helped Romain to develop as a driver in a way he perhaps wouldn’t have otherwise. Had Romain been next to a more junior driver, or a less capable driver, we probably would still not know how good Romain is. For Romain to be delivering the results he is doing so now, it’s really very much because he is driving next to probably one of the best Formula 1 drivers ever. Kimi has been a tremendous help in the development of Romain. Q: WILL THE TEAM AND YOU MISS KIMI? The fact is he will be missed and I really think that this is one of those partnerships in Formula 1 that is – and will be remembered as being – very, very special. It’s difficult to think about the fact he’s not going to be in our black and gold car next year. I think he feels the same way. There’s no such thing as regrets, but there is such a thing as sadness even if disguised sometimes… he will be missed, and from what I’ve discussed with him he will miss this team. It doesn’t take anything away from the relationship and it doesn’t take anything away from the fact that I certainly gained a friend and that will continue to exist. 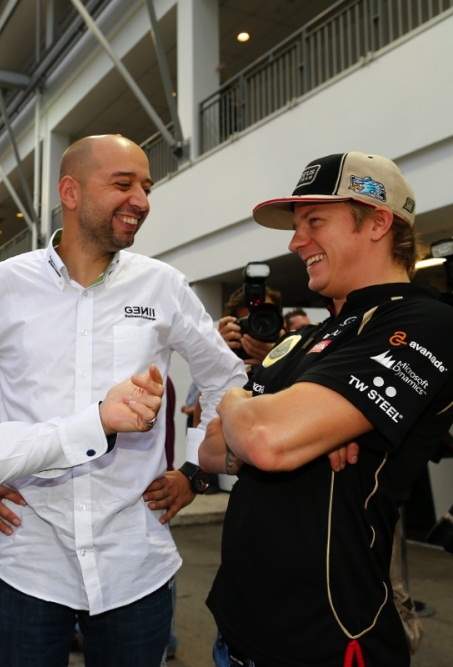 Q: WHAT DO YOU THINK THE FUTURE WILL HOLD FOR KIMI? I think Kimi will do a good job at Ferrari. We’ve seen what he is capable of so we know what a formidable force he can be. While Lotus has downplayed Kimi Raikkonen’s late arrival in Abu Dhabi as a storm in a teacup, recent events have clearly revealed the high emotions behind the Finn’s ‘Iceman’ image. Against the backdrop of a season-long issue relating to unpaid wages, Raikkonen was angered in India at the tone of a radio conversation with trackside operations director Alan Permane, who was telling him to get out of the way as Romain Grosjean closed in. The blunt language used stirred matters up, and team principal Eric Boullier was forced to publicly apologise following a backlash from fans. Raikkonen himself, who returned home to Switzerland for a few days after the India race, was upset enough – according to sources – that he even briefly considered not racing for the team in the Abu Dhabi Grand Prix this weekend. In the end common sense prevailed, helped by what one team insider referred to as a bit of ego-massaging from senior management, and meant Raikkonen flew to Yas Marina late on Thursday so he could jump in the car on Friday. While it is clear that issues do remain between Lotus and Raikkonen, his reaction to events in India have also highlighted a fiery side to his personality that is perhaps not so obvious from the image that is often portrayed on television. One senior team member said on Friday that while Raikkonen is the ‘Iceman’ at race weekends as he locks himself down for a steely focus on doing well, away from the racetrack he is a totally different character. Anything that stands in the way of success, and especially Raikkonen feels is time wasted, is considered redundant. That includes dull PR days – and getting shouted at over the radio. That is why things got so emotional this week. Raikkonen is a driver powered by a passion to succeed and wants only to deliver the very best for himself and his team. That is why however difficult the end of the season may be as he signs off his Lotus career, senior members of the team are more than happy to admit that they will miss him next year when he pulls on those red Ferrari overalls in Melbourne. As team owner Gerard Lopez said on Friday: “The fact is he will be missed and I really think that this is one of those partnerships in Formula 1 that is – and will be remembered as being – very, very special. “It’s difficult to think about the fact he’s not going to be in our black and gold car next year. I think he feels the same way. “There’s no such thing as regrets, but there is such a thing as sadness even if disguised sometimes… he will be missed, and from what I’ve discussed with him he will miss this team. That radio message was unacceptable, but most of this situation is being overplayed.